Bulldogs Community Children's Centre is a state-of-the-art childcare centre located at the iconic Whitten Oval in Footscray. We deliver high quality and inclusive early education and care for children aged six weeks to six years. Our team of nurturing and experienced educators will partner with you to develop a play-based learning program that helps your child realise their potential. Even more importantly, our educators will ensure your child is safe, secure and happy while at Bulldogs Community Children's Centre. Engaging and flexible indoor and outdoor play spaces which are filled with plenty of natural resources to support children's development. Delicious and healthy meals are prepared by our friendly and talented chef to fuel children’s growth and development. Meals regularly rotate so children never get bored. Strong partnerships with the Western Bulldogs Football Club, Victoria University, Footscray City College, St Johns Primary School and the Fresh Program to extend children's learning. Children can learn about responsibility, empathy, and compassion by caring for our resident pet rabbits. Excursions, meals, and nappies are included within our daily fee, which means there are no hidden costs for families. Bulldogs Community Children's Centre vacancies change frequently. Register your interest in our centre here. “Since day one the staff have been nothing but friendly, caring and professional. I feel we are very lucky that our children are in such capable hands. I would recommend to anybody to send their children here.” Penny M.
“Over the last four months, I've seen my son thrive at Bulldogs. His language and social skills have improved exponentially, and he loves the days that he attends the centre.” Ellie C.
“‘I had such a fun time at Bulldogs today, Mum!’ It's so nice to hear those words as soon as I pick my son up every week. Bulldogs, to us, creates a sense of community through constantly positive staff, sharing, fun and learning.” Kit W.
Play is the best way for children to learn. That's why at Bulldogs Community Children's Centre, your child's early learning program will incorporate a variety of open-ended and structured play-based experiences. Activities will be guided by your child's interests and capabilities, ensuring your child gets the most out of their time in childcare. To ensure equitable and transparent access to childcare, Maribyrnong City Council provides a Central Registration System (CRS) for all eligible children. If you wish to enrol your child at Bulldogs Community Children’s Centre register via the Council’s CRS program on their website. Further information is available here. Bulldogs Community Children's Centre features high-quality resources, materials and equipment, with a strong emphasis on natural materials. Our indoor play spaces are filled with an abundance of natural light, providing a bright and welcoming environment. Our rooms feature an open plan design that enables educators to set up flexible play experiences that foster children’s imagination, curiosity and exploration. shaded areas for sun protection. Your child’s program will be delivered by Bulldogs Community Children's Centre's experienced, passionate and nurturing teachers. Our educators are wholly committed to ensuring each child receives the best possible childcare experience. Educators will work in partnership with you – your child’s most important teacher – to develop a childcare program that reflects and builds on your child’s interests, curiosities, and skills. Educators will also recognise and celebrate your child's unique background and culture, incorporating these into their early education program. If your child has additional needs, our teachers will work with you to ensure your child gets the most out of their early education experience. They can also connect your family with specialist support if needed. 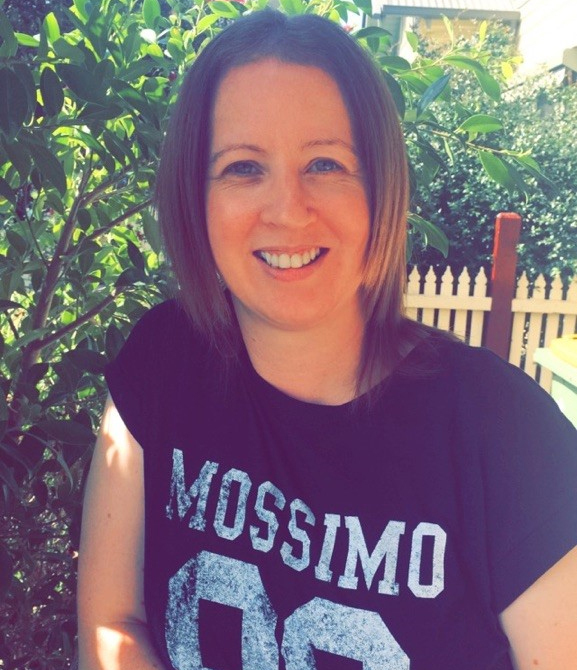 Hi, I’m Melissa McLeod, the Centre Director of Bulldogs Community Children’s Centre. I’ve been working in the early childhood sector for 20 years, including 17 years at ECMS. I’ve held various positions at ECMS, including as centre cook, room leader, 2IC, acting director and centre director. In 2009 I also had the opportunity to work at the ECMS head office. My biggest achievement at ECMS has been the opportunity to contribute to the setup of Bulldogs Community Children’s Centre. I never imagined I’d be running this brand new purpose-built children’s centre in partnership with the local AFL team, which also happens to be the team I follow. Over the years ECMS has encouraged me to upgrade my skills. In 2005, I completed my Diploma of Children’s Services, and in 2007, I went on to complete an Advanced Diploma in Children’s Services. ECMS has always been very supportive, and I have had an enjoyable and rewarding experience working closely with all children and their families. I enjoy watching children grow and reach their full potential. My team of highly motivated and professional teachers is committed to ensuring all children achieve positive outcomes. We believe all children need to feel safe, secure, trusted and included within our program.